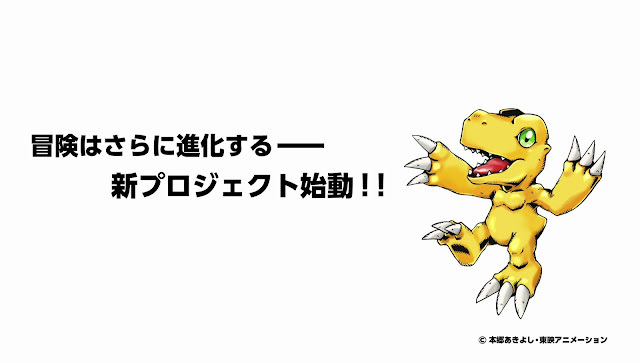 僕たちのデジタルワールド: A new unknown digimon project is in the works? A new unknown digimon project is in the works? "The adve ntures finally to evolves, launch new project." Currently no info or news is revealed, if it's another anime serie, game or sequel? We will bring you more news when they update. Maybe... Adventure Tetra (or 02.5), with 02 casts? Probably with their side on what happened before Tri, when they were "killed"? Hmm... 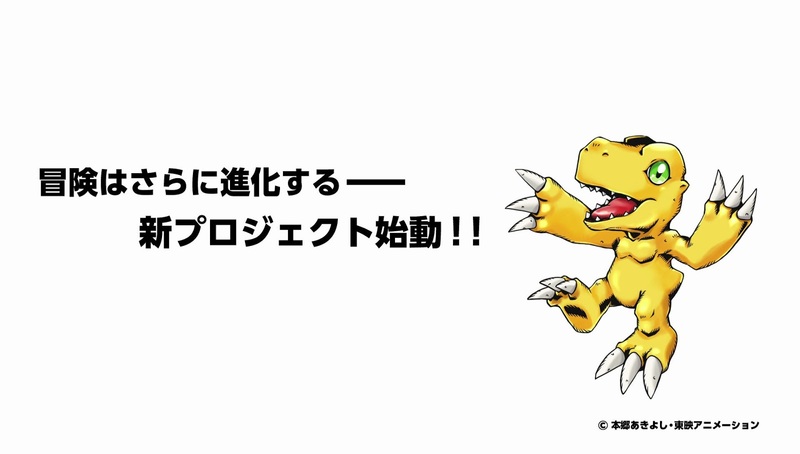 I'd usually write it off and say 'It's because Agumon is Digimon's most famous mascot, but after you pointing it out... Maybe it a new game? I hope its on Switch if it is. But... It could also still be Adventure Tetra, because using Veemon is a little too obvious. Dang... That's too bad. So, I'd say that it could be related to Tri since the preview appeared at the end of the (Tri) movie, which Appmon demographics (probably) won't see and (Digimon Story) players won't watch. A game, possibly. A series, maybe. Another movie... I'm not too sure. But if it did well then I guess it could be a another movie. Also, just like the anon below me said, I hope the writer changes (or improves). The current story is, well... Pretty good. But speaking off of the nostalgia, it felt a little less like Digimon, somehow. Even Digimon Hunters felt more Digimon like. Maybe that's because the change in age, making the characters mature etc. The characters felt a little too "we'll act as a group" than "let's each use our strengths to its fullest" making them look slightly one dimensional, I think. But I have hopes for Digimon's future. Considering how the 02 Digimons are considered resealed due to Reboot, how will a story for the supposed Tetra would work? Which is why I said 'before' Tri, not 'after' Tri. Unless there's something I missed from this last movie...? Tri didn't feel like Digimon. It felt like some generic anime with Digimon concept slapped into it. Not the world, not the characters we used to love. The art-style definitely didn’t help either. I gave tri until the very last second to change things around and impress me but ultimately, it managed to leave a very bad taste in my mouth. I hated the final movie so much. They did NOTHING special for it compare to the other movies. Everything was the same, except WORST in most parts. Half of the movie was wasted on the kids reflecting and thinking what they should do. Matt role was extremely useless and boring. If they were trying to make his moments emotional, they failed miserably. Mimi's existence is solely to cry and scream whenever something’s happen, and Sora is there to pat her on the shoulder. Izzy is being Izzy. Joe barely has any lines or does anything here. And of course, Kari and TK. They don’t add much to the movie. We STILL don’t know ANYTHING about the Dark Ocean despite it being briefly shown few movies back. TK’s role is what Sora is to Mimi, just patting on the shoulder. I could go on and on why I hate this movie and the tri series as a whole but I’ll just leave it at that. For now. Dark Gennai mentioning Daemon and Diaboromon as potential allies (?) to recruit. This gives me hope that they’ll go over Daemon’s story again. Hopefully, this time, they’ll get things right. Toei, please, get some actual writers that know Digimon and the Digimon universe. Also, make sure the art-style is fits Digimon. Honestly, Tri's conclusion was rather padded out, and left way too many loose ends to just call it a day. In particular the way the 02 Kids were handled. Finally doing something with Daemon and the wasted Dark Ocean plotline has long been called for. And pretty much what we should have got to start with.